Does our editor's example equation need to be changed to something else? What are the contraints on the Logo? For example, can it only be located across the whole of the top of the page? Is it possible to relocate some of the navigation options onto the Logo area? @physicsnewbie Yes, it has to be located there. I too thought it could be good to move some navigation options there (those on SE, plus categories, minus badges), but it isn't possible, yet. I have personally never felt the logo alignment to be odd, it's quite common on many websites. Wow, these are very good ideas for the logo. How did you make them? I think they can be furthered by adding a \(\hbar \)between "p" and "o" in the first one. It will make sense, because of Physics Overflow (Ph, and o). But this already looks very nice and creative. You need to make something vectorizable. Right now the aliasing looks terrible. I like the current logo. Nice job, guys. @user10001 good point about maths overflow. @Dilaton Can you change the logo to the non-caps version? http://img3.wikia.nocookie.net/__cb20140301030644/psiepsilon-test/images/6/6f/Logo.svg I agree with user10001 that having the caps makes it look less like mathoverflow. I also now think that with the caps "P", it looks less neat, and less artistic compared to the one with the non-caps letter. I think, that Ron's answer can be a favicon, this can be the small logo (like "mo" is for "MathsOverflow"), and physicsnewbie's could be the main head logo (though it could be edited a bit as Ron has suggested in his last comment 2 or 3 or 4 minutes ago there). Maybe, Ron's logo can be added in the left side of the logo by physicsnewbie. I had in mind something that isnt' too cluttered and therefore too much of an eyesore, something that plays on "over flow" in a physical sort of way: Physics over the flow - get it? I think it would be good if you omitted the physics entirely, and just left "overflow". Don't use two fonts, this is the mistake math-overflow made. 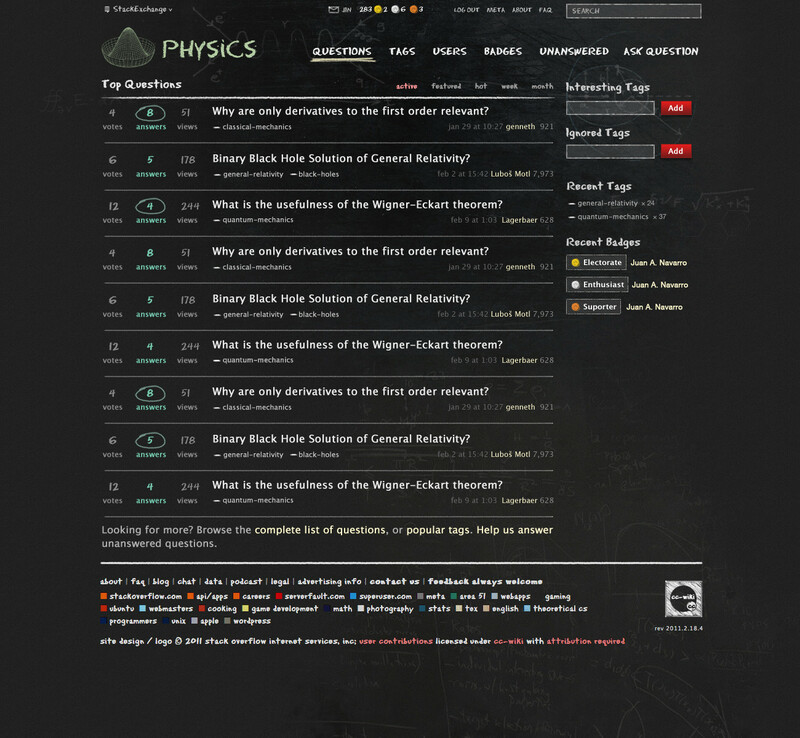 Huh, but the logo should surely contain something that hints at the fact that the site is about physics ...? 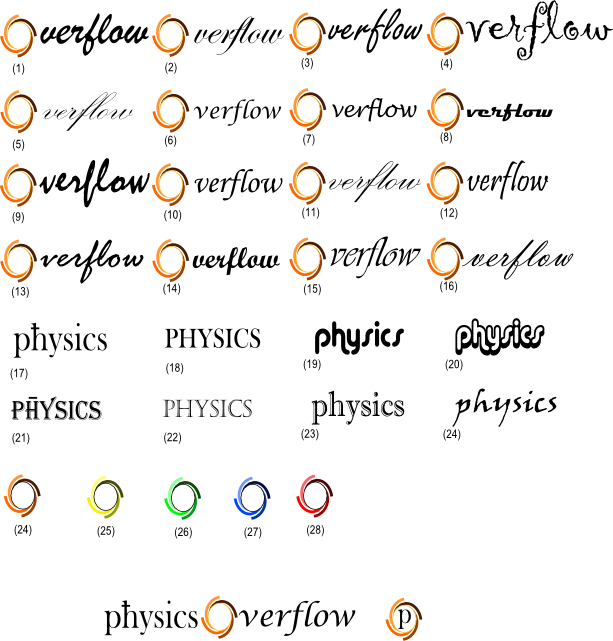 I pesonally rather like the allusion to MathOverflow, as PhysicsOverflow will be a high-level rather professional site but for physics. For people who have heard about MathOverflow it is self evidently clear what a PhysicsOverflow is meant to be from just reading the name. Ok, then it should use the same font. Perhaps then just Physics, without the overflow, so that it is "physics" over flow, as in over flowing water. But whatever, it's not significant. I like the water thing, but I think the flow should be more clearly a flow, rather than arrows. @Ron I did it like this because Dilaton wants to emphasize this site is at the same level as mathoverflow. Personally, I think we should sever any link with "overflow" because stackoverflow is a programming term, and instead we should think of a name with a physics feel: "Relativistic covariance", "stacked branes", "vibrating strings" etc. Then we can create a logo for it. But I'm under the impression that the votes were in favour of "physicsoverflow"
I played around with ideas for "flow", and chose this because it's simple, and less of an eyes sore. Once it gets too complicated, it takes away from the main "physics overflow" text. Do you not think, that this idea can sort of be mixed with Ron's "Electron flow" ideas? Physics over the [insert Heller's art here]? Physicsnewbie: I agree with you--- physics overflow is too derivative, I always err on the side of originality. But the domain is registered, people decided. I would have gone with a crazy neutral name, like "Understatic", which doesn't have any "physics" or any stackexchange or stackoverflow connotations. Regarding the logo--- It is an artistic mistake to use two different fonts in any logo, an amateur mistake. Mathoverflow made it, but we don't need to. @RonMaimon I disagree that using two different fonts is not a good idea. Have you seen the answer by user10001? It uses different fonts, but that is hardly noticeable. This is a combination of Ron's idea and physicsnewbie's idea. I' think this should be cropped further, but I'm not sure how. Artistic, but I wouldn't describe it as a sticky trademark, as suggested in the question. Think of IBM, Apple, Nike etc for inspiration. Mathoverflow base their icon on their main title, so I thought we should try and make more use of ours. For example, my choice is 17, 24, 6 shown immediately above. -1, This defies all the improvements you suggested for the logo. The hbar is ridiculuous, the physics is written in a boring TNR (doesn't look LaTeX-ish), the verflow looks unprofessional, the O is not meaningful, and the logo overall doesn't look modern. It may look nice at first, but if we implement this, I assure you that it will start to look stupid in a matter of less than a week. @Dilaton that's just a cursive "r"
@dimension10 The current logo got 4 upvotes and I didn't want us to modify it beyond all recognition without the go-ahead of everyone else, so I thought it would be better to suggest my own modification on this thread. I don't see much of a difference between this hbar and the current one - they both look good to me. I tried to make the "physics" look formal and I guess "boring" just like the maths in math overflow and physics in physics stack exchange, and to give it an air of seriousness. Then you say: "I assure you that it will start to look stupid in a matter of less than a week". Well that's just your opinion, and someone else has upvoted it. I'm open to suggestions on how to improve it and thought me doing one myself would be less of a pain for you than asking you to modify yours, putting it on this thread, and then getting people to declare it OK.
@physicsnewbie Sure, just that this does not have any of the things you suggested. For the "physics, I used Euclid, which is very similar to the typical "LaTeX" font. @dilaton it's English "flowing" joined up hand writing. I'll see if there's an easier to read alternative. @dimension Could you give me a list of what I suggested on the original logo, which I haven't done here, to remind me? What's your impression of the mathoverflow logo? I didn't realize the "physics" on the current logo was to give it a latex feel, which is a great idea. It's strange that it doesn't look formal as I'd expect it to. I've used Baskerville Old face on the "physics", which according to some is the most convincing type face. The thing is, that cursive looks unprofessional because it is used too much in kindergarten. I don't know how convincing Baskerville is, but it doesn't look modern or inviting. The "O" also looks like a logo that for-profit companies use. Where did you even get that from? @dimension10 In my updated answer, I've changed the cursive overflow because you and Dilaton don't like it. It's not meant to be inviting to everyone, as with the mathoverflow font, and the 'O' is meant to convey a swirling towards the center, as in a vortex. I'm trying to create a unique logo similar in style to the stack/mathoverflow ones that gives an air of professionalism. Professionalism doesn't always imply for-profit since mathoverflow started out this way. I'm under the impression that we're trying to make this site the physics equivalent of mathoverflow. @physicsnewbie Nope, the O you suggest dpes not imply that, the current logo's O does. The "O" here is a common logo for for-profit companies, which doesn't look like what we are trying to create. Saying that this logo resembles the Maths Overflow logo is a joke. Nor does our current logo, but still, we can't make all our design look like Maths Overflow's. Maths Overflow's logo doesn't look modern. It is of a "boxy" layout, and as Ron has correctly said, that doesn't look modern, at all. Did you get the O from an online logo designer? I remember having seen a similar design. This is dangerous, as the image may be copyrighted preventing our use of it, and besides this means that this image can easily be searched for. @physicsnewby I think the "physics" suggested plus any of the Os (the yellow one is a bit pale) plus verflow 6 could look quite good too. Maybe one could put them up for voting too, before the public beta starts? Huh, did you really mean to ping me or rather physicsnewby ...? @Dilaton Oops, sorry, fixed : ) I got confused. Regarding the O's, only the blue O (27) would fit in with the site's colour scheme. However I am extremely cynical (not sure if this word is right here) of the logo's originality, because physicsnewbie is repeatedly dodging my question regarding where he got the O's design from! I doubt he made it himself, because this looks to me like a common logo for for-profits. The O here suggests to me something like "J.J. Packers and Movers" or "A.A. Advertising Solutions" or something random like that you can find on the streets. @dimension10 the design is mine, inspired by the picture in the current logo, I did it on Inkscape. I want to keep it simple, but I can add some more detail if you think it doesn't look like a spiraling vortex enough. Can you give me a few names of for-profit for companies that use this design? Just to make sure that I'm not inadvertently copying theirs. 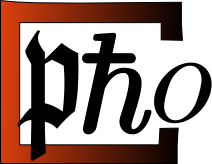 @physicsnewbie Also, we are not "convincing" anyone about the fact that we have a logo. @physicsnewbie Regarding the list of things you suggested that you haven't implemented at all, here. The hbar hbar looks disgusting. It is not even italic. The fonts are both unprofessional, especially all of them for the verflow. The capital suggestions look scary, bulky, and unprofessional. The H conjugate is ridiculous and meaningless. What the hell, are we a high-school level site about complex numbers and complex conjugates? That's what I mean. It is too vague. It does not look modern. The colour scheme is ridiculous and does not fit that of the rest of the site. The O does not give the impression of flow, or a black hole, more of black hole firewalls. You talk about unprofessional fonts on children's birthday cards and yet more than three fourths of the verflow's that you suggest are such fonts. (1), (5), (9), (13), (2), (3), (11), (16), (14), (15) look like signatures from the early 1900s. (4) looks like crayon-drawn welcome messages. The only ok ones are (10), (6), (12), (7). But they don't look modern. but (17) is the best. However, it is still bad, with a horrible hbar, and a 1950's font altogether. For the O's, all but (27) do not go with the site's colour scheme. They are all signs of another "JD Brothers' Packers and Movers" or "AK advertising solutions." And by no way, are these better than our current logo. Anyway, physicsnewbie, stop suggesting logos, and focus on something more important, please! @physicsnewbie Can you show us the SVG source too then? I can't find such a for-profit at the moment (Google Image Search just returned a photo of a pistachionut), but I'm sure I've seen such logos before. @dimension10 yes, I can email the source to anyone that wants it. @physicsnewbie Just upload it somewhere and link it. 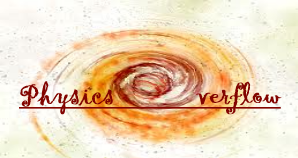 I got the impression that @physicsnewby now put in some effort to help with the logo too, which is good. But I still hold to my statement that this logo does not look professional, but instead actually gives a pseudo-sophisticated look. It does not look half as good as the current logo. This is transport 3 (it looks good small, but one should ask Eric's permission, of course). These are all very nice contemporary artworks, they depict some visualization of a 2d electron flow, and are pure physics. If you would like to see what can be done with these, here is a modified Heller image, color-adjusted with a hand-painted hbar, that Heller probably wouldn't even recognize. I like these, especially the last one, but we should probably choose something less boring than the \(\hbar \)... Maybe some other constant, or a Lagrangian Density symbol... Or a state vector, or anything else except for an h-bar, it's too common. The state vector is also easy to make it look as if it' is curved, since it's on the surface of something that looks curved. Aargh! It takes a long time to draw those stupid things, as I don't have a tablet or touchpad. If someone has a tablet handy, then perhaps they can do it, I am using mouse. The problem with "state vector" is that it is hard to identify when small, hbar remains visible and clearly identifiable, even if you shrink the logo down to a few dozen pixels. It is also a glyph that is uniquely associated with physics, it occurs in no other context, so it makes a natural symbol. It is commonly used for a reason. A logo is a graphic, symbol etc that can be easily redrawn by hand, rather than a picture. Physicsnewbie: Who are you? Can you use your real name, or at least identify yourself by another handle people recognize? This is a private beta. I disagree that there is any need for a logo that is not an image, but the last image can be used to make an hbar with a circle around it as a logo/trademark. I disagree. There are tons of logos which are not easy to draw. How easy is it to draw the logo of Physics.SE? However, I think the favicon can be such a drawing. @Ron Maimon: Oh, come on, it's ok to not use your real name or to not use something anyone can recognise you by. But I agree with the rest of your comment. @ron you can do it using coloured pencils and paper, and then uploading the image which others can work on. I would like to downvote this post myself. It's ugly. I would like to downvote this post myself. I couldn't resist taking on board Ron's suggestion on my previous design, so what do you think? @dimensio10 why the downvote? I'm not suggesting it replaces the existing one. @physicsnewbie Then what are you suggesting? @dimension10 Fair enough, since the question did ask about what the Logo should be, and you don't like it. Yes, that explains my downvote, doesn't it?